If you like mac and cheese, then you'll love this recipe with ooey gooey cheese and a little kick of spice. Creamy cheese sauce, tender macaroni and cayenne pepper offer up a delicious mac and cheese recipe, with very little work! Meanwhile melt butter in large saucepan on medium heat. Add onions; cook 3 min. or until crisp-tender. Whisk in flour and pepper. Cook 2 min. or until bubbly. Gradually whisk in milk until blended. Cook on medium heat until mixture boils and thickens, whisking frequently. Reduce heat to low; simmer 3 minutes. Add 1-1/3 cups cheese; stir until melted. Toss drained pasta with sauce. 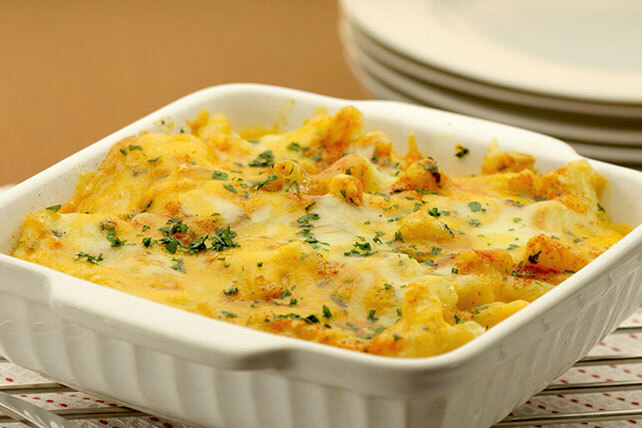 Pour into 1.5-L baking dish and sprinkle with remaining cheese and parsley. Cover and bake 15 min. or until heated through. Try this recipe adding 2 cups blanched broccoli florets before baking.